Tomorrow Miranda returns from Colorado Springs where she has been meeting with YWAM staff at the offices of the ICN. About 5 years ago, Tom (not his real name; the gentleman on the far right of the photograph above) initiated the idea of having Com Teams around the YWAM world. After years of working for YWAM communications on a global level he had realised the need to delegate responsibility to field-based teams. AfriCom was the first of those teams and has paved the way for Comm Teams to multiply and to become part of YWAM's global communication strategy. Miranda had the opportunity to meet with a number of people now working to promote Comm Teams throughout the YWAM world, brainstorming with them ways to strengthen the initiative and help make teams more effective. YWAM Communications is going through a big transition at the moment as our global magazine - The International YWAMer - moves from being a print publication to an e-zine. 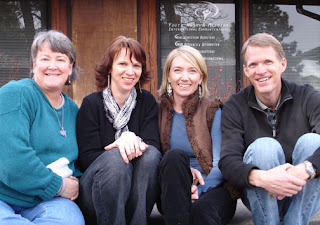 Tom and Stacey (far left) have written and edited the IY for many years and now Tamara (left of center) will take over. An e-zine has certain implications for our YWAM staff in Africa since many of them will struggle to receive that email or to access the incorporated links. AfriCom will therefore be creating a special print publication for Africa, a combination of our 'Djembe' magazine and the IY e-zine articles. The guys at ICN are very supportive about this initiative, helping us to finance the printing and mailing; this is an indispensable tool for YWAM Africa because it helps to mobilise new missionaries and encourage those already on the field. Training, this week & next.